Analog clock. Its not a widget, its a standalone application. Youcan change digits, arrows, faceclock, and also change colors ofall, make it for as you wish. Its comfortably use on tablet ormobile during night. When you switch off second arrow, clocks enterin economy mode. Touch down on screen to enter in menu forsettings. Support landscape and portrait mode. If you want theclock to be called up when you connect the charging to your mobilephone (or tablet), turn on the charging tracking option and exitthe application using the Home button, and then when the chargingis connected, the application appears again on the screen. If youdo not want to enable this option, exit the application using theBack button. Make a digital clock out of your tablet or smartphone. It isconvenient to use at night during sleep. Economically it spends thebattery. Many different settings, fonts, etc. When the charging isconnected, the clock can appear on the screen. Now the clock knowshow to speak. Also clock has stopwatch option. The stopwatch isvoiced by voice, it can be used in sports - you just need to wearheadphones and turn on voice acting. Durak mini throw-in, passing with Epaulets, offline This version ofthe game Durak is a smaller size version of the game 'Durak'. Idealfor smartphones with a screen resolution of 1280x720 and below. Inthis the game removed all the additional graphics, that is - deckcards, tables, 'shirts', pictures in the help. Only 1 deck left, 1shirt, 1 table texture and epaulettes. Thereby the size of theapplication was significantly reduced, and the speed on weaksmartphones also increased. In the rest, all the logic andpossibilities of the game as in the full version. It should benoted that if the samsung galaxy win gt-i8552 'Durak Throw-In' anaverage of 35-40 FPS, then in the mini-version it was possible toraise to 60-65 FPS. With such FPS much nicer to play. 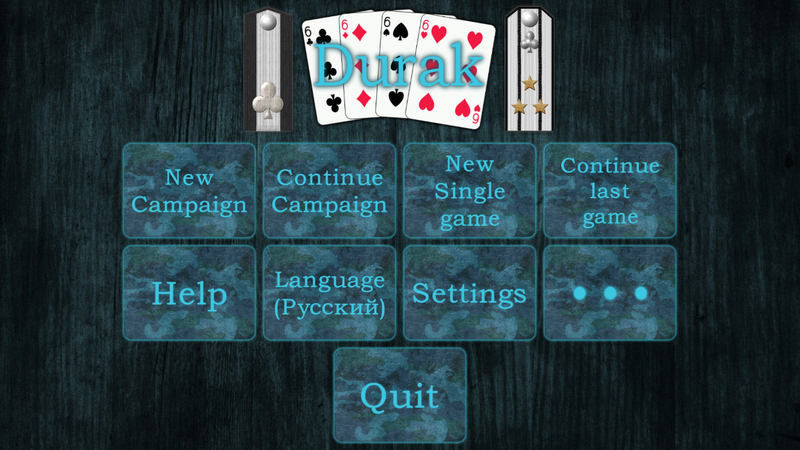 Connect with friends on local Wi-Fi and play Durak online (Дураконлайн). Texas Holdem Poker is the world's favorite online poker game. NowPlay the best hold'em poker on your Android offline, NO WIFIREQUIRED! Beat every cowboy in Texas, in this great "Texas Hold em"Poker app called Governor of Poker 2 ! Millions of poker playershave enjoyed Governor of Poker, without an internet connection.With an easy Texas Holdem Poker tutorial for players that don'tknow how to play Texas poker, but want to learn poker and goodopponents for star poker players with real texas poker skills! Thepoker chips you win with player Texas Holdem are required to buyhouses, win transportation, play against advanced poker AI cowboys,win Texas and beat the new Governor of Poker. TRY GOVERNOR OF POKER2 FOR FREE, THEN UNLOCK THE FULL POKER RPG ADVENTURE IN THE GAME!•Get ready for many hours and hours of Hold'm Poker play: - Over 80challenging poker players to beat; - 27 stunning casino saloons in19 amazing Texas Holdem cities; - Get hold of the five big pokerassets. •Amazing and Fun Texas Poker AI Engine: The best pokerengine will challenge poker beginners and world poker championsalike. Refine your card tactics to match the countless holdm pokerplaying styles of your opponents and watch them go "Steamy" andTilt after showing off your great card bluffs! The offline Playerswill play better in each new city and poker tournament, no cheatingallowed! •Full Story and Progression: Governor of Poker 2 startswhere the first game ended. A new Dallas government decided to puta ban on all Texas Holdem poker games and now considers the game tobe illegal in Texas. Take matters in your own hands and prove themwrong! Poker isn't a game of luck, but requires poker skill. •PlayAlways and Everywhere Poker offline, no internet connectionrequired: There is no live internet connection required to play agood game of Texas hold'em poker, you can just play Governor ofPoker 2 offline anywhere you want! Don't wait for real worldplayers in multiplayer poker games, that don't respond or leave thepokergame or go all in every poker hand. Just play thissingleplayer pokergame against realistic AI players! •Customizepoker characters: Prove you are a big shot by customizing yourpoker style to fit your reputation. Vvisit one of the many greatcowboy hat shops across Texas and get yourself the poker deluxe hatof your dreams! The game includes HD Poker graphics for a greatexperience on all Android mobile devices: phones and tablets.Travel through Texas by Train, Casino Boat or Coach and play pokerwhilst on your way to the next poker city in Texas. Every city haslots of exciting cash games and big poker tournaments with evenbigger Chip prizes, competition and bigger tournaments. You’llexperience more checks, calls, raises, folds and all-ins than youcan imagine! Enjoy sit-n-go tournaments, Wildcard tournaments,highstake poker, Cash games. ** NO WIFI CONNECTION REQUIRED ** Haveyou always been a Texas holde'm pokee fanatic? You'll love Governorof Poker 2! What are you waiting for cowboy? Click install,download and prove you're worthy of the great poker title: GOVERNOROF POKER ! **** Governor of Poker 2 Reviews **** - Gamezebo: "Makespoker accessible without being too simple. Great sense ofpersonality. Excellent poker tutorial.. It's a Royal Flush." -Jayisgames: "Governor of Poker 2 is well-made, highly accessible,and surprisingly addictive for all kinds of players." - Zylom:"Play this challenging poker game now!" - Miniclip 5 stars out of5: "Howdy! Finally it’s here, Governor of Poker 2! Packed with lotsand lots of poker extra’s! More cities to conquer and tournamentsto play!" ** NOTE: This pokergame is FREE to play in Amarillo, butwill require IAP to enjoy the full game. Please [email protected]dagames.com if you have any issues or suggestions, wewould love to help! Facebook :https://www.facebook.com/governorofpoker2 Download Governor ofPoker 2 now and enjoy the Texas Holdem Poker Adventure!